Sunbary-on-Thames, 05 June 2014 – HyperX®, a division of Kingston Technology Company, Inc., the independent world leader in memory products, today announced the launch of HyperX Impact memory for gamers and enthusiasts who want to upgrade and boost performance in their laptops and small form factor PCs. HyperX Impact replaces the current SO-DIMM offerings under Genesis, PnP and LoVo into one family. HyperX Impact achieved a world record for the fastest SO-DIMM frequency running at 2666MHz. 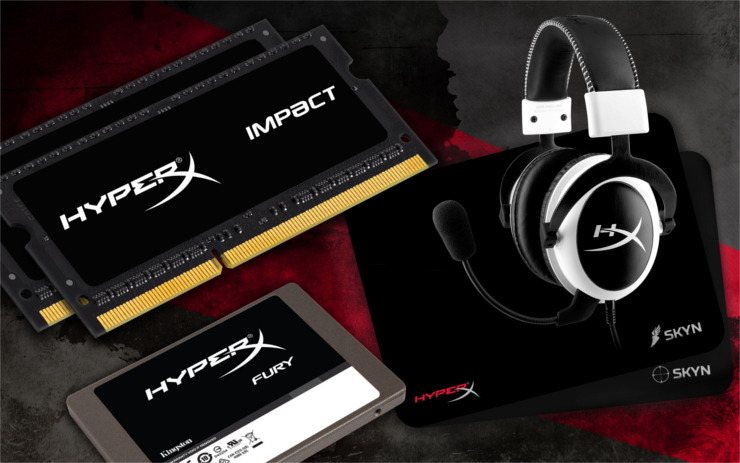 HyperX Impact is available in frequencies ranging from 1600MHz to an industry-fastest 2400MHz in capacities of 4GB and 8GB single modules and 8GB to16GB kits of 2. Voltages start at 1.35V and upgrading is effortless as Plug and Play (PnP) functionality is designed into every module to automatically overclock within the system speed allowance without manual tuning. HyperX Impact can also be used to upgrade small form factor systems such as the Gigabyte BRIX, Intel NUC and ZOTAC ZBOX. For entry-level gamers, HyperX FURY SSD features locked synchronous NAND and is powered by the LSI SandForce SF-2281 controller with SATA Rev 3.0 (6GB/s) performance. The new, entry-level solid-state drive offers exceptional read/write speeds of 500/500MB/s and is ideal for quicker boot times, application loading and file execution. It is available in 120GB and 240GB capacities. HyperX FURY SSD is the latest addition to the HyperX FURY range as it joins the recently released HyperX FURY DRAM. HyperX FURY SSD is available as a standalone drive with an included 7mm to 9.5mm adapter. It is backed by a three-year warranty, free live technical support and legendary HyperX reliability. - “HOT” HyperX OC Takeover competition. Overclockers from around the world will compete for £6000 ($10,000, USD) in total prize money for the top marks in Maximum Memory Frequency, SuperPi 32M and XTU with a secret processor to be revealed at the event. Following Taiwan, HyperX will stage four regional online HOT tournaments on hwbot.org to lead up to a £9000 ($15,000, USD) World Finals held at 2015 International CES®. - A preview of the forthcoming special White Edition HyperX Cloud headset that features the same award-winning comfort of the black HyperX Cloud, but with white ear cups and stitching. - HyperX Skyn: A paper-thin hard mouse pad with an adhesive bottom to stick to a desk, yet removable with a lift of a tab on the side. HyperX Skyn comes in a package of two. One mouse pad creates a surface to give the gamer more control for accuracy while another allows increased speed for fast moving action. HyperX is the high-performance product division of Kingston Technology encompassing high-speed DDR3 memory, SSDs, USB Flash drives, and headsets. Targeted at gamers, overclockers and enthusiasts, HyperX is known throughout the world for quality, performance and innovation. HyperX is committed to eSports as it sponsors over 20 teams globally and is the main sponsor of Intel Extreme Masters. HyperX can be found at many shows including Brasil Game Show, China Joy, DreamHack, gamescom and PAX.